Cam's Cinematic Episodes: 7 DAYS OF THE BAT - Coming Very, Very Soon. 7 DAYS OF THE BAT - Coming Very, Very Soon. Howdy y'alls. Just wanted to let you all know that there won't be a new review this week. No, not due to my somewhat well known laziness, but rather due to the preperations taking place for this upcoming event on "Pop-Culture Episodes"! Waaaaaaaaaaaaaaaaay back, I mentioned that there would be an upcoming event on here called "7 Days Of The Bat" taking place before the release of The Dark Knight. 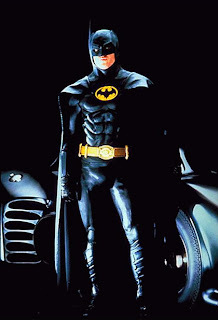 Well, I never forgot and indeed have been rewatching a number of Bat-films, taking notes, and typing up retrospectives for the most well-appreciated (and despised). Plus, there will be a more personal (read: less quippy) essay that will close the whole shebang. So, keep an eye open this Saturday for the first installment; a revisit to now distant 1989 when Michael Keaton ruled the omniverse. Where's my Wall-E review you hack!!! screw you!